At tonight’s Interactive show, sounds will be provided by oddjob. Unnatural Biospheres are visual contrasts held in double chamber glass vessels. Each environment is expanding and paired based on reactive elements or growth patterns of crystals, plants and microorganisms. Bioluminescence, thermal stimulation, and conductivity are explored in these environments. Glow vessel contains ZnS copper chloride-doped monoammonium phosphate crystals on the interior chamber while sheathed with bioluminescent protista on the exterior. And they both glow. CuSO4 vessel activates copper sulfate in both chambers. The interior deploys an electrochemical process to grow copper crystal and the exterior floats a plastic seed to cultivate blue vitriol. Additional biospheres include Thermal Vessel, Popcorn Magic Vessel, Sweet Bait Vessel, and more. The collection of vessels is inspired by enclosed ecosystems, artificial biospheres, and symbiosis. Their reactions and relationships between “organisms” are contrived and never exist in the natural world. We introduce the relationships, but the ongoing growth is uncontrolled. Explore Phoenix Perry‘s Bot Party at tonight’s Interactive Show! Bot Party in an interactive sound experience for humans. The bots have a problem. They have no way to communicate with their friends. Can you help? They need you to touch another human holding a bot. Through you the bots use the proprietary bot to skin to skin to bot communication protocol (BSSB) to send encoded secret messages to each other. Hold hands with other players to get the bot sound spectacular started! The Huni Kuins are an ancient Amazonian ethnic group, based between Brazil and Peru. This video aims to honor the Huni Kuin culture and to help give visibility to a group who fights so much for its rights, but remains very vulnerable. Katxanawa is a traditional Huni Kuin song that expresses a wish for abundance and luck to people. Recognition of patterns is one of the most elementary activities of man. A forest created from patterns is a metaphor for humanity’s attempt to make visible the underlying logic of nature. Recent technological 3d simulations follow this same principle: from logical descriptions of the world, but mainly through the translation of our spatial perception in terms of a geometric complex, we can create the illusion of reality. Therefore, the artistic proposal that Same Putumi and Vanessa Rosa are developing tries to overcome the notion that indigenous cultures would be opposed to the understanding of the world according to new technologies. On the contrary, ancestral cultures still have much to offer in terms of systems of knowledge and experimentation. These pieces are circular mosaics that combine traditional mosaic techniques and materials with specially designed laser cut elements. The series title, “Fragment Habitat,” refers to the basic shapes that form the composition of each piece, which are created by taking circular “snippets” from various diagrams, maps and technical drawings found on the internet. The resulting abstract composition then becomes the ideal habitat for the myriad tiny items that I work with, as well as the larger laser cut elements that surround them. The pieces are designed to be hung in any direction, and to have the look of mysterious maps to fictional lands. Use a small catapult to launch mushrooms into a hole (think skeeball). You’re prize for getting it in the hole? A free mushroom! At Friday’s Interactive Show, come see Lilli Fisher‘s painting You Always Relished Disaster. Catch Sophi Kravitz’s work KITTY in the air at Friday’s Interactive Show! KITTY can be steered through hoops for points! The concept is a 4 player indoor blimp obstacle course, and the story is one of sacrifice, shape changing, and revenge. The blimps are named Poppy, Shrinky, Donna, and LaFloaty. These blimps live on Proper Popper, a fictional planet, and are on a mission… to stay alive as long as possible, to beat out the other blimps for points, and to not get popped. Purring is included for maximum extra. Sophi is an art-engineer living and working in the Hudson Valley, NY. A common theme in her work is surreal play. KITTY will be playtested for the first time ever at SOLAR PUNK. More info on Hackaday.io. 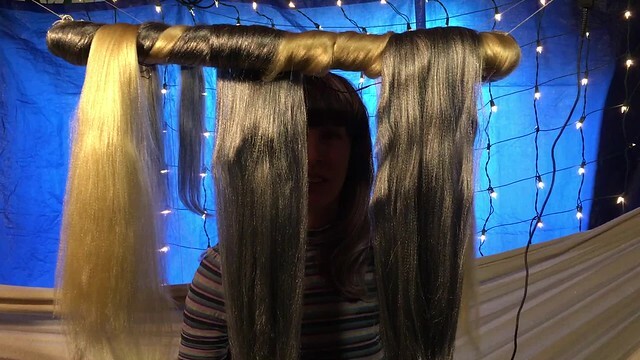 Hair Cube is an ASMR drum kit for folks who are into the tickles you get from the sound of brushing hair. Its built to resemble a baby’s mobile that dangles clangy objects to rattle. Soothing, yet titillating too. The operator is lifted from the ground in a hammock and given combs and brushes and rubber applicators to perform with the Hair Cube. The hair is hot. Each ponytail equipped with a live microphone amplifies the sound of the hair tools or fingers or whatever you want to interactive the hair. Hair Cube is a prototype. Our goal is to sell the concept to Anthropolgie for their home goods/furnishings department.